For an obsessive swimmer who craves the endorphins, the past two years of failed therapies for a bum shoulder have been a bummer. I've been acupunctured, acupressured, cracked, Rolfed, electro-stimulated, nutritionized, lasered, therapized, osteopathed, hypnotized, rheumatologized, cortisoned, massaged, medicated, iced, heated, surgerized and more. Much more. All these treatments have yielded benefits, except for the "much pain, no gain" neck-wrenchings of a certain Dr. Hertz. Our brief relationship ended when, after waiting an hour, I was asked to reschedule an appointment because Donald Sutherland had arrived. I love Donald -- he was a super doctor in M*A*S*H! -- but not that much. I would happily have stepped aside for his son Kiefer, a.k.a. 24's Jack Bauer, though, so he could save civilization as we know it before the next commercial break. But it always seemed the healer was doing something to me or instructing me to adhere to a specific, do-or-die nutrition, exercise or stretching regimen. Some gave interesting advice that didn't quite address the problem at hand, like the enigmatic Zen acupuncturist who said little during our sessions except "You must eat very slowly and chew each bite at least 40 times before swallowing." Advice is frequently contradictory. Ice or heat? Breathe in or breathe out? Rest or test? Meditate or medicate? Physical therapy or surgery? Yoga or Pilates? And where, exactly, is my core? So when a friend told me I ought to check out Stacy Barrows, a Century City, CA-based Feldenkrais practitioner, I figured I had nothing to lose. At our first meeting, Stacy took my history and then directed me to a massage table, I assumed for a vigorous shoulder workout. When she began touching my big left toe so lightly I could barely feel it, my New Age alarm went off. My concerns about Stacy were assuaged when I learned that she's a licensed physical therapist and an articulate student of neuroscience who achieved Feldenkrais certification only after undergoing a four-year intensive training program. That she's also a certified Pilates instructor and a former competitive swimmer who's giving a seminar next month about how to improve your stroke was chocolate icing on the cake. As for the toe/shoulder perplex, Barrows explained, "The Feldenkrais Method often involves work in a remote area of the body by helping a person make internal connections to improve a far-away injured or underdeveloped area. An injury can trigger guarding patterns that make the sore spot resistant to direct treatment. By offering clarity to a more receptive part of the body, the injured area becomes more relaxed and amenable to healing." 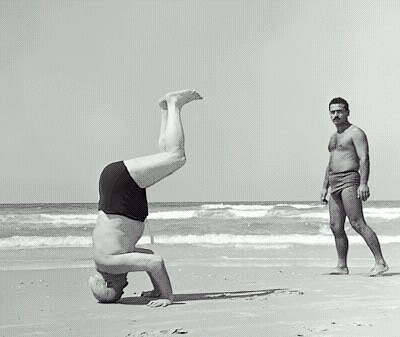 The Feldenkrais Method was named after Dr. Moshe Feldenkrais (1904-84), whose accomplishments included a mastery of physics, world-class status in judo and teaching 75-year-old former Israeli Prime Minister David Ben Gurion to stand on his head -- Ben Gurion's head, that is. Drawing from such thinkers/healers as Mabel Todd, Kano Jigoro and Gustav Flechner and such disciplines as dance, yoga, Rolfing, the Alexander Technique and hypnotherapy, Feldenkrais facilitates self-healing through a science-based approach to movement and posture. Instead of telling you how to stand, sit or move, the practitioner suggests you experiment with various gentle maneuvers until you find your own comfort zone, always noticing even slight increments of discomfort and stopping before pain sets in. In other words: no pain, much gain. You don't need a degree from Singularity University to know that the mind can accomplish astonishing things. Last month, Google founder Sergey Brin, before a large audience, manipulated a robot limb thousands of miles away by sending brain signals through a computer program. So it's hardly a stretch, pardon the pun, to believe -- as Sandra and Matthew Blakeslee reveal in their book The Body Has A Mind of its Own -- that another feature of Feldenkrais called motor imagery -- imagining and visualizing an activity like piano playing or swimming -- can be nearly as successful as actual physical practice. I'm not talking about the faux philosophy of The Secret or the idiocy of Dodgers owners Frank and Jamie McCourt hiring a "healer" and a "Phrenology Consultant" to, respectively, impart positive thoughts to the team and examine the skull shapes of employees to eliminate "negatively karmic" influences. Rather, by encouraging mindfulness of our body movements at a granular level, Feldenkrais claims we can weed out harmful physical patterns and replace them with healthful ones, like the way daily mindfulness meditation can enlarge those areas of the brain that produce healthier mental states. After a couple of weeks of visits to Stacy and following up on my own, my shoulder feels a bit better and I'm able to swim for 20 or 30 minutes without too much pain. But, like Nassim Nicholas Taleb, author of The Black Swan, I'm a skeptical empiricist and don't want to get caught up in a pleasant narrative without more evidence. Meantime, I pitched an editor friend -- not a New Ager by any means -- on a piece about Feldenkrais and the mind/body connection. He was interested, but said he didn't know much about it -- except that it had helped save his son's life. Next time: How everything you thought you knew about stretching and posture might be wrong.